Outline: Sinful people bound by Satan; God's concern. Jesus' life on earth, His death and resurrection; victory over Satan and evil spirits. Illustration of Jesus' power. Invitation. Long ago God looked down upon all the people of the world. He was sad because all men and women and children were evil. He saw that they did not want Him. He knew that their thoughts were held by fear. They were suffering because of sin. All people were afraid about many things. God was sad because of the way those people lived. He is also sad when we do badness. Why was God sad? God knows that Satan has us bound and doesn't want to let us go. Satan leads us away from God. God thought to Himself, "I would like to free the people from Satan and bring them back to me. I will send My own Son to do this for them. He is equal with Me. His name is Jesus." Jesus left His place in heaven with God, and He came to this world. He walked among the people. He was truly a man. He was also God. One day Jesus died, hanging on a tree. He willingly gave up His life in order to pay for our sins. But death could not hold Him. Jesus rose from the grave. By doing this, Jesus broke the power of Satan. He broke the power of the evil spirits also. How could He do this? Jesus is mighty. He is mightier than Satan. Jesus is able to rescue us from the power of Satan. He is mightier than all evil spirits. Listen now how Jesus could drive away the evil spirits from a man. One day a man ran toward Jesus. This man cried out and cut himself. Evil spirits were controlling him. These spirits wanted to destroy him. Jesus was not afraid of them. 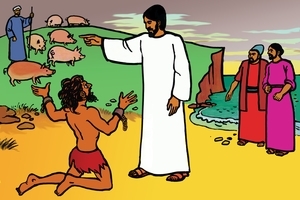 He came close to the man, and He spoke: "Evil spirits, go away, and leave this man!" That's how Jesus spoke to them. That was all He had to do. Immediately the evil spirits rushed away from the man. When Jesus came, the evil spirits had to go away. Then this man who was free came to Jesus, and he said, "Thank you, Jesus. Now I am a new man. You have sent the evil spirits away. Now I want to follow You all the time. I will follow all that You want me to do." Jesus is the mighty One Who came to save you and me. If you talk to Jesus, and ask Him to be your Master now, He will free you. He will take away the evil from your heart. He is the mighty One. With Jesus, you need not be afraid of Satan or of the evil spirits. You do not have to fear anything. Let us turn to Jesus, and follow Him. We must obey His words and trust in Him. GRN has recorded a version of this script in 412 languages and dialects. See full list.